Lawrence Bill sent me a link last Sunday to a New York Times story about staying neutral with your decor – especially the very basic, expensive stuff. In the very broadest sense, I tend to agree. A basic rule is, the more expensive the thing is – the more conservative your choice should be. Go crazy and trendy with accessories and stuff that’s relatively easy to switch out.That said, I do not think that all-white bathroom tiles, as one example, are your only option. In fact, that scares me. For your retro renovation, you can be confident in picking a nice colored tile – a soft blue, green, yellow, beige, aqua or yes, even BW Tile pink. Trim your 4×4 ‘field tiles’ with white 2×6’s, add a white tile floor (AO Chloe, one of the new Daltile mosaics, or maybe you can find something excellent locally.) Voila — you have a pretty, timeless backdrop that any one of many accessory color combinations would bring right over the top easily! And you know that means wallpaper, too. 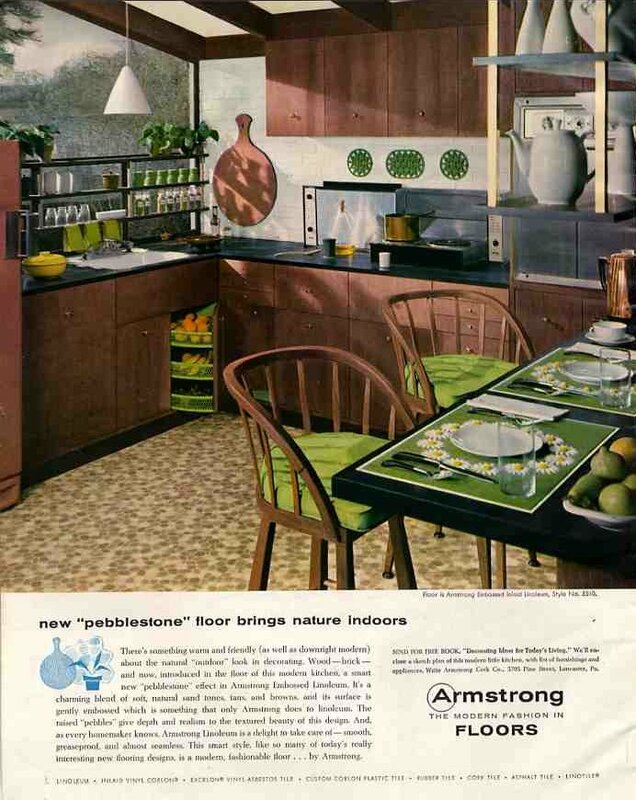 And how about the 1957 Armstrong kitchen above. Wood cabinets. Black countertop. White walls. Pretty neutral, huh. 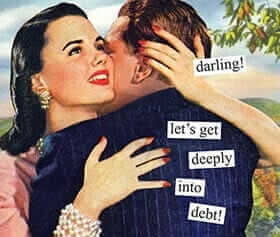 But then how about that punch of chartreuse, the shapely dinnerware, the daisies – even the cutting board? Makes it a work of art. Decorating is so much fun. If you know what is good for you, you will stay away from: prefinished floors, concrete counters, glass tiles, vessel sinks, bamboo floors, oversized furniture, humongous range top hoods, oil-rubbed bronze faucets…hmmm, what other ubertrendy items can I add to ensure that I offend every reader somehow? Read on. Can I save my hootie ring? This is an interesting thread for sure. I am amused by and respectful of the die-hard purists. I do plenty of restoration work as a hobby and can be quite obsessive in that regard. However, when it comes to kitchens and baths, there is a functional aspect which cannot be completely ignored. Clearly, advances in functionality have been made in the last 75 years! 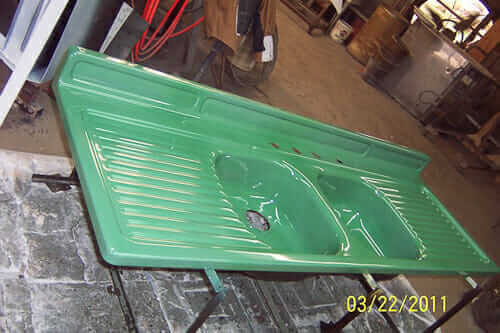 Two years ago we did an upgrade in one of two 1958 baths — the long vanity had a medium blue tile top which was in great shape. However, the permanently mounted undermount white sink only got worse and worse. 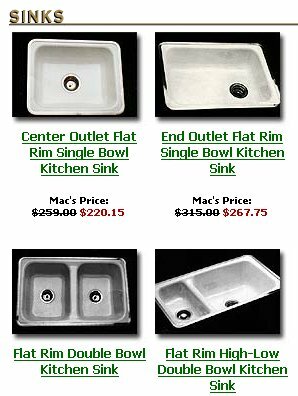 We made the difficult decision to cut it out, and actually sourced exact-match tiles to repair parts of area surrounding the hole — and then went with a simple rectangular surface mount vessel sink from Kohler. It looks fantastic, and quite in keeping with the design of the bath, even though such sinks did not exist (to my knowledge) in 1958. Far more important is that we retained the extensive blue and white original tiles. Where I’m going with this: as a designer, I think that often the best solution is a combination of retaining whatever original stuff still works (functionally, aesthetically) while replacing/augmenting with new stuff that works better, yet still works aesthetically with the original period materials, etc. Hi Nick, Your bathroom sounds lovely. I will quibble, though: In the past 70 years — and especially the past 60 years — I don’t think that “clearly functionality has advanced” much at all — in fact, I would argue that the dimunition in quality means products are functionally (if you include longevity) worse today! 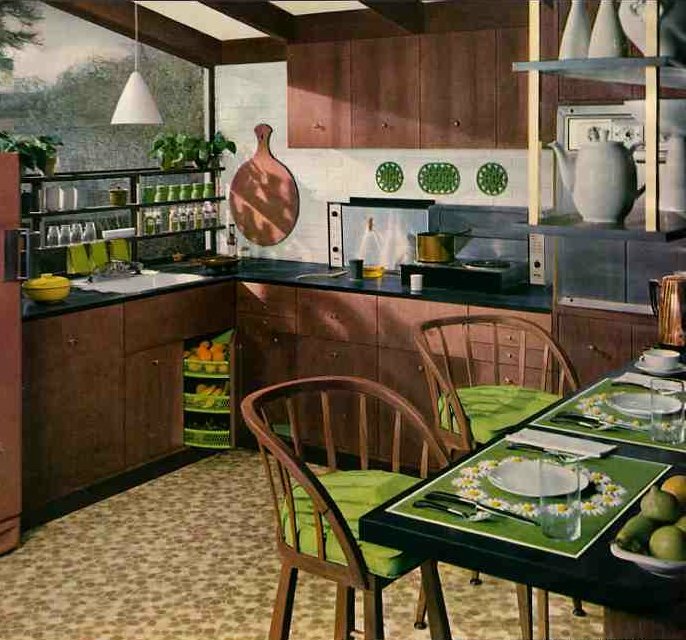 Our bathrooms and kitchens are designed pretty much the same now as then. 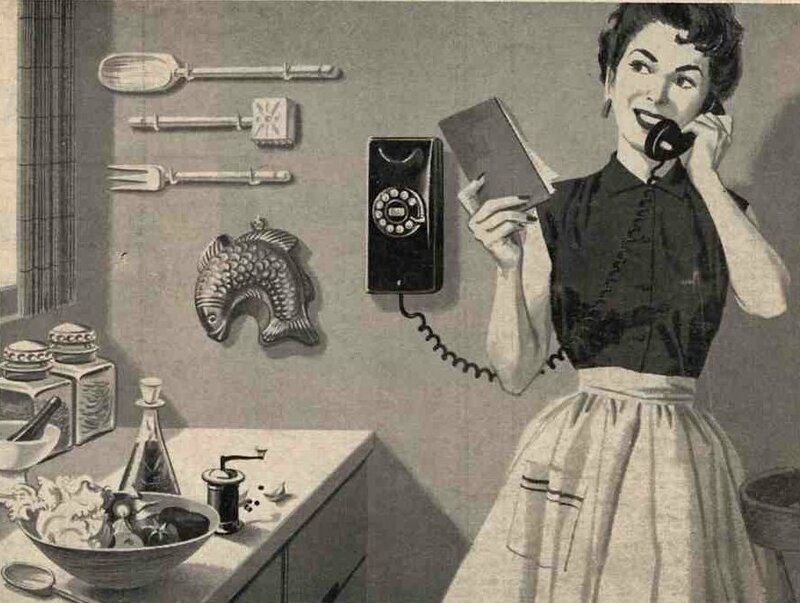 Yes, there have been a handful of technological advances that created new products: Solid surface countertops… microwave ovens… some window treatment designs… fiberglass doors… but golly, now I am out of ideas of any more. Maybe: Double-pane windows argon gas low e windows today — and more energy and water efficient appliances — alas, the windows won’t last as long as the better, old growth wood of the mid-century era and the appliances made today break much faster in many folks’ experience. Of course, functionally, things can wear out. The the actual components – pretty much the same then as now. What do you think? 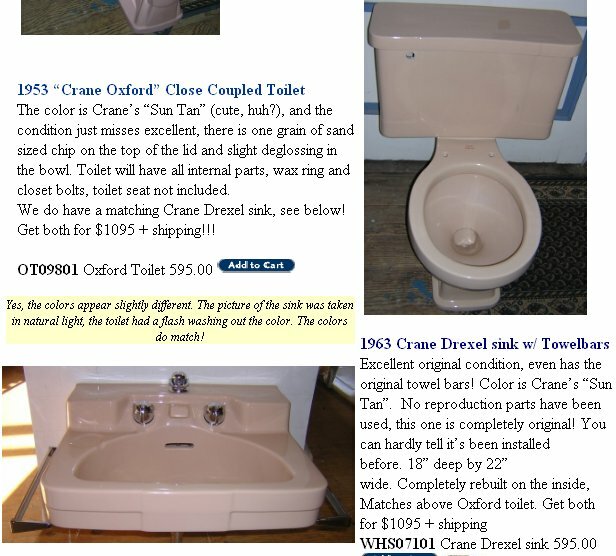 What’s really available today for a kitchen or bathroom that was not available in mid-century America? I sell vintage furniture and have been a massive fan of retro for over 20 years. The definition of Retro (in regards to interiors) has revolved slowly over time, but one thing stays true: it never strays much beyond the era of the 50s-70s. There is lots of cool 80s stuff I love but it wasn’t mass produced and its of only niche appeal. Beyond that it gets even more niche. In short there will never be widescale returns to interior styles beyond say the 70s or 80s because it doesn’t have the same cultural resonance. Also mass produced styles beyond the 70s were so cheaply made that much of it just breaks, and 90s/00s/beyond stuff was not made with a ‘cool’ design aesthetic as in previous eras, they were/are made to be as inoffensively bland as possible. With topics like this thread, the ‘people in the future treasuring Ikea stuff from now’ argument doesnt work because the Ikea bathrooms aren’t part of the old house’s original design. it would work better if the argument were regarding new contemporary builds, but Retro Rennovation is really about people who truly respect the original design motivations and approaches behind MCM builds. If people consider those who feel like this to be ‘purists” or use the vaguely mocking term ‘I dont want to live in a museum’, I think they should leave retro properties alone (vintage fixtures and fittings are finite things and more often than not irreplaceable when ripped out) to people like Pam et al who ‘get’ the whole thing.